Ranking higher than your competitor in search results is vital to any business, but as time progresses, more and more websites will clutter the Search Engine Results Page (SERP) making it harder to keep up with your competition. In this article I will explain how to do keyword research like a professional SEO company. From building solid backlinks to implementing Rich Snippets in order to be more attractive on a SERP, there are simply too many aspects to consider them all in just one article. However one of the most important things you can do is pick good quality keywords for your blog posts and articles that have low to moderate competition and therefore allow you to rank higher with less effort. It’s a good practise to consider every keyword and search query variation before you even start writing your article or blog post. I know It’s hard to think of every possible case right off the bat so in order to get new keyword ideas I use the Google’s free Keyword Planner by feeding it just a couple of keywords and phrases that I think people would be searching for. Suppose I created a tool for web developers that generates responsive Youtube embed code for them based on the video’s URL (true story). By submitting these keywords to the Keyword Planner I realise just how many more terrific keywords and phrases people are using to search for similar services that I never would have thought about! I now have a whole lot of keywords and phrases that Google suggests I should use and by clicking on the Avg. monthly searches tab I can sort them from high to low. 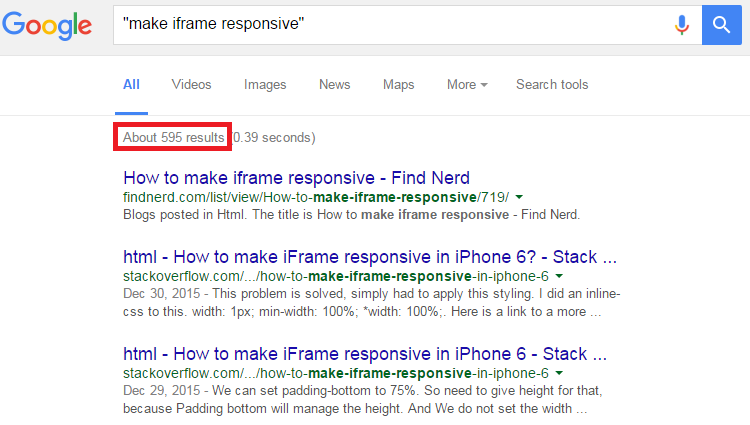 This way I can weed out keywords that get too little action per month and would be of no use for me. Normally I don’t look at keywords that get less than 100 searches per month, but to be honest, there’s not really a universal blueprint for this so just choose the keywords that make sense and get a decent amount of queries each month. Contrary to popular belief, the competition tab in Keyword Planner is completely irrelevant for us because it’s meant for advertisers- the guys who pay Google through Adwords. 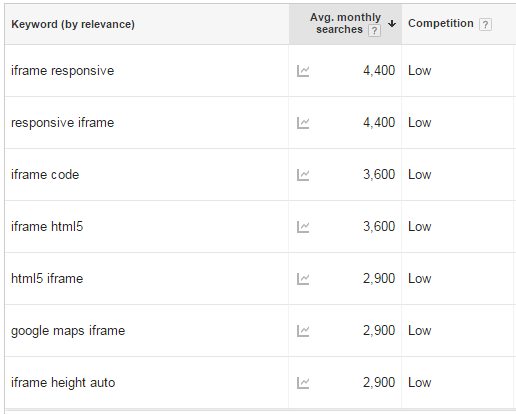 Don’t make the mistake a lot of newbies do by simply looking in the competition tab and sorting out keywords with “Low” competition. This approach is just plain wrong. But how do you check for real life competition? Simply put the entire phrase between quotation marks to look for that exact phrase and see how many results can Google fetch for us. Now I know just how many websites are using this exact phrase in order to rank so I can easily figure out my chance of ranking higher based on the ratio of avg. monthly searches vs the actual results on a SERP. Congratulations, you now know how to choose which keywords to use inside of your articles the right way. Hooray! But as you probably realised, doing keyword research the way I explained can be very time consuming if you have a hundred different phrases on your plate so If you want to save some of your valuable time, I can do the work for you for just five bucks!